Nowadays, Everyone use mobile Phones Specially for Connecting to the Internate and other Service also more than use for Actually for making phone calls. The Quality of the Internate, You receive significantly. some countries like US,UK and many more have advance Telecom Neywork better than Other countries. It is not necessarily have some quality of network coverage as Big cities. Your Smartphone, You know the capacity of your mobile network coverage using, Right side upper part of signal bar, always show G,2G,3G,H or 4G and many more. Today What we are talking about, but you know What about those Codes mean?? so keep reading this so You’re Never confused. Lets start work from slow to fastest. 2G in G means Generation. 2G was launched in 1991 and these technology allowed Data service such as SMS and MMS. The first time Radio Signals is better than 1G, so Great Spectrum and help to Mobile phone with Market. 2G has only speed of 50 Kbps(Kilobits per seconds), these are inclosed big part in Europe and North America, now being turned off 2G network. G is short for (GPRS) General Packet Radio Service. It is started in 2000, After 2G. G has unofficial name is 2.5G G has transfer Maximum Speed of 114 Kbps(Kilobit per Seconds), which make it the slow connection. G is not Suitable for Instant Messaging like Fb Chat, Whats App or Hike. Because these are Extremely Slowly. 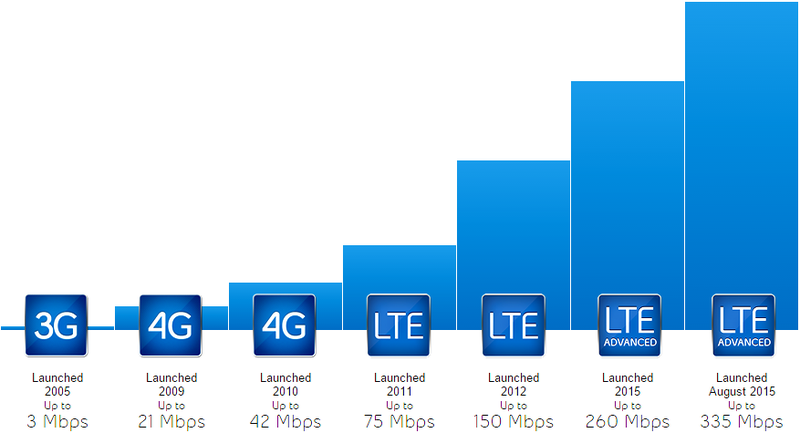 E represent (EDGE) Enhanced Data Rates for GSM Evolution. E started in 2003 and that time it has very popular becuase its support Maximum Speed of 217 Kbps(Kilobits per seconds). so speed about almost 3X Faster Than any of Predecessors. its a Faster Than G but You will Wait for any video Streaming on Youtube But the General Website they have Work done Fastly. 604 EDGE network in 213 Countries. this are Widest used Mobile Network in the World. its Unofficial Nickname is 2.75 G but E is for EDGE is suitable for this Network Coverage. 3G is actually a lot Older Than People Realize. These first 3G launched in Japan in 2001, the first network of 3G in US was version windless and went live in July 2002. Universal Mobile Telecommunication Service(UMTS) is based on the 3G and these rather than GSM,GPRS,EDGE because its Maximum speed of 384 Kbps(Kilobits per seconds), its more than Adequate for streaming Music ad Ever Video. Today you will find 3G Network coverage found in everything on mobile Television and other Internate Technology. H Symbol means, That High Speed Packet Access(HSPA) Network. HSPA is based on the same technology as 3G but Replace 3G technology (UMTS). its Maximum speed is of 7.2 Mbps(Megabits per Seconds). its easily Handle Download Music, Video,Web Browsing and other Application. H is support For Long term Download as a fastly like Movie Download or Large files. Worldwide began in 2010, But is very famous and available in Almost all Countries. H+ is Next Generation of H, Name refers(High Speed Packet Access) H+. these are greater Download speed than the Previous version. When 6 Brought these speed 14.4 Mbps , 7 Brought increase speed 21.1 Mbps, 8 Brought increase to 42.2 Mbps, 9 took it to 84.4 Mbps. Now release 10 at Maximum Speed of 168.8 Mbps. Now important to Remember, one will rarely see these speed during Normal speed. Most people can get New technology Network Coverage Like 4G Network but this are Limited availability. Rearly or Few people see notification 4G network in Bar, Who say lucky has Access the Greatest Mobile Network! 4G !. The 4G network in the world in 2009 form online in Stockholm, other country joined but slowly for these network coverage. In UK occured in 2014 but US is the largest cities Now have the Network. In 4G use (LTE) Long Term Evolution. LTE has High speed, Specially Next Generation LTE-A Static to rollout. WiMAX Network not supported system like 2G and 3G. LTE has Draws less battery power on a mobile. Now 4G is able to go Maximum speed as 1 Gigabits per seconds and these are suggest that when 5G Arrives. it also support speed upto 1 Tetabit per seconds. it should be known that 1G, 2G, 3G, 4G, 5G etc refers to the different generations of wireless communication technology characterized by having a defined range of speed. *Packet-based means data is broken into packets before being transmitted. Difference between Voice Over LTE and 3G voice services? LTE by design doesn't have a Circuit Switched core which means even the voice calls are routed through the packet switched networks.The challenge currently lies in the fact that LTE specifications doesn't have a mechanism to hand-over a call to CS network which in most cases is 3G network. In real world, say for example a subscriber is driving in Area A with LTE coverage and is using VoLTE services and then he enters area B with only 3G services. In such a situation, the voice call will drop. 1. Have LTE everywhere - This will happen but will take it take sometime to have it. 2. Re-direct CS calls to 3G networks - This is the economically viable and technologically possible, intermediate solution to the above problem. 4G LTE is a packet switched technology whereas 2G and 3G are circuit switched. The difference between circuit and packet switching is that in circuit switching, a link between the two parties having the call is made and it exists as long as the duration of the call. A particular amount of bandwidth is reserved to make the call. Packet switching does not require a dedicated line to be active for a call. It allocates portions of the bandwidth to different users for a certain duration. Data is broken down into packets and these are sent with packets from other users through a shared line. This makes packet switching less reliable than circuit switching. The advantage of packet switching is that it conserves bandwidth. Voice traffic from cellular phones is usually carried through circuit switched lines. Packet switching is prone to increased latency as some packets may take longer to arrive. This is detrimental to voice calls which have strict limitations on latency. For example, if a person transmits "Hello", the communications system would break this down to packets and send them individually. Some packets may encounter a delay and some could get lost. It is the duty of the receiver to re-assemble the packets. With the loss and delay, all that the person at the other end can hear would be " he" and "o". With advancements in technology and better protocols, voice transmission over packet switched networks had gotten better. Skype, Google Hangouts and other VoIP services now offer better call quality. This greatly depends on the choice of transport protocol, the bandwidth of the links and the choice of the codec. 1) CSFB or Circuit Switched Fall Back, when a user makes a voice call the mobile latches to a 3G or 2G network that is available to make the call. Data traffic is sent through the LTE network. 2) VoLTE or Voice over LTE, which is similar to VoIP and the voice traffic is packetized and sent through LTE. The operator will have to invest heavily in the network infrastructure to improve call quality on VoLTE. Most operators who provide LTE services also have legacy services (2G or 3G) support in the area. This is why they prefer the CSFB option for voice calls.